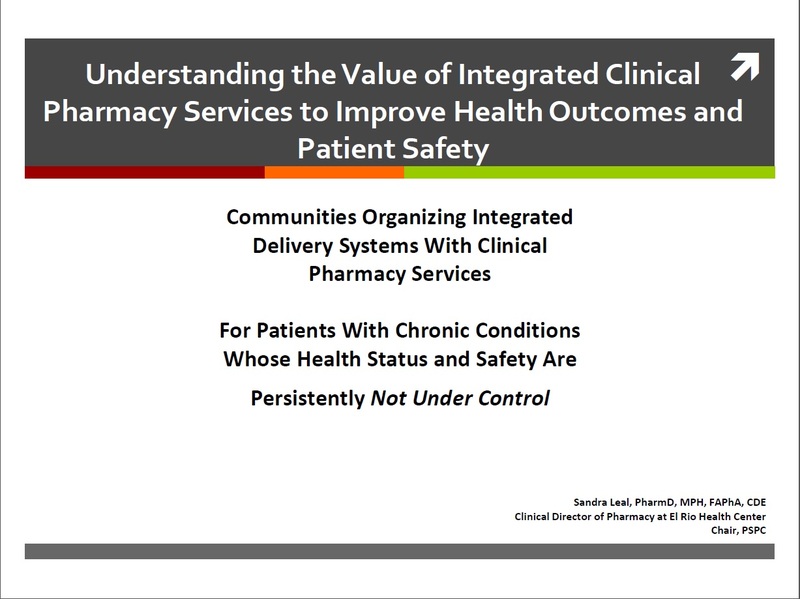 Webinar presentation was titled "Understanding the Value of Integrating Pharmacy Services to Improve the Health Outcomes and Patient Safety." Discussed benefits of integrating clinical pharmacy services in underserved communities citing Project Impact Diabetes as a model for success in these populations. There was a positive response from the Public Housing group and establishing a relationship with the group could lead to potential opportunities for collaboration. Many participants have an interest in impacting underserved communities. Sandra was joined by a group of people: an experienced PSPC team from QueensCare; Romic, director of pharmacy at Glendale Adventist Medical Center; Terry Hair of Community Health Alliance of Pasadena (CHAP); and Ryan Gates from Kern Medical Center. Ryan's safety net hospital serves one of the most disparate counties in the state and is severely undercapitalized and underwater. He understands the value of the pharmacist on the care team and was one of the key players in the sponsorship and passing of SB 493. Micah Hata from Western University was also involved. The Inland Empire is also a prime target for establishing pharmacist teams and Micah could be instrumental in helping provide resources via residencies and student rotations. CareMore, a medicare advantage organization with significant resources allocated to pharmacy participated as well. Content shared included outcomes related to pharmacists interventions like Project Impact Diabetes results, CMMI outcomes from USC and results from PSPC. The future integration of AIMM with APhA Foundation and value of pharmacists in creating a sustainable model was also discussed. A follow-up meeting was held in Sacramento to work on policies to fund integration of pharmacists to spread successful models.This presentation was a great opportunity to network with new sites that want to replicate care models with pharmacists. The audience was directed to the APhA Foundation website for additional information and resources.